“I adhere to Frank Lloyd Wright’s principle of organic architecture, which is an architecture that is natural and appropriate to the site, budget and climate,” says John Rattenbury, architect of the home on 4842 E. Mountain View Drive. This home is a part of the Mountain View Estates subdivision designed by Taliesin Architects in the 1980s. Rattenbury came to Taliesin West as an apprentice of Frank Lloyd Wright and never left. He still lives there today. He was a principle architect and planner for Taliesin Architects until 2003. He dedicated his life to architecture in the tradition of Wright and gained national notoriety as the designer of the stunning 1997 Life Magazine’s Dream House. 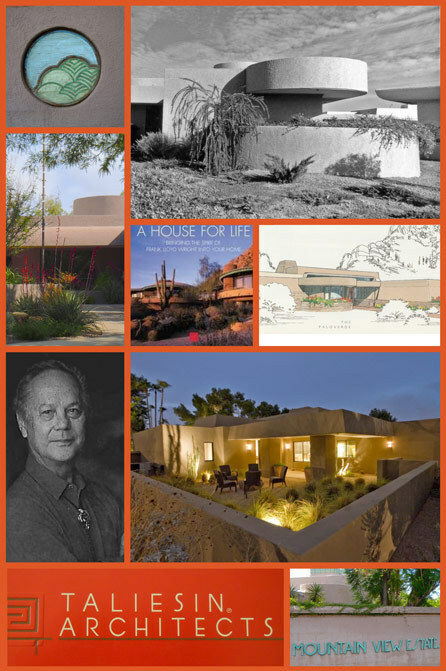 He wrote two books, A Living Architecture and A House for Life, as a way to teach people about organic architecture. In the 1970s, the developer and contractor Russell Riggs acquired the 40-acres where Mountain View Estates sits today, bounded by 50th Street and Tatum on the east and west and by Gold Dust Rd and Mountain View Drive on the north and south. Riggs hired a very reputable firm, Taliesin Architects, to design a luxury subdivision there. Taliesin divided the land into one-acre lots, creating about 40 houses. A housing subdivision designed by a group of Frank Lloyd Wright apprentices is going to be nothing like your typical housing subdivision. “I learned from Frank Lloyd Wright that the design of the home should reflect the place where you build it,” Rattenbury says. This principle was applied to the Mountain View Estates, making sure that each home was appropriate for its site and paying special attention to how the entire community fit within its context. Arnold Roy, a senior fellow at Taliesin and the supervising architect of Mountain View Estates, says that the firm started by designing a series of spec homes. But instead of just plopping these spec homes onto lots randomly, they carefully assigned each design to specific lots. “Even though all the sites were nominally 1 acre in size, because of the roads, cul-de-sacs, and other restrictions, they varied in shape and so did the ability of putting a certain design on a certain lot,” Roy says. Taliesin Architects wasn’t only concerned with the design of each individual home, but also of the way the homes worked together as a cohesive subdivision. “We were very concerned with adjacencies so that everything would be compatible,” Roy recalls. They had one of their designers select a color palette for the subdivision so that the colors of the homes would be compatible and would look appropriate next to each other. Besides an appropriate response to its site, Roy says that they employed two other Wright-inspired principles to Mountain View Estates. Proportion, Roy says, was always very important to Wright and it is something Taliesin Architects was keenly aware of when designing Mountain View Estates. Another element important to Wright was “the entrance of light into the buildings through top light – clerestories and skylights,” says Roy. And so the homes at Mountain View Estates feel light and airy because of the way the light enters them. One Mountain View Estates home designed by Rattenbury in the tradition of Wright, is currently available. Contact Jarson & Jarson @480-425-9300 for a personal viewing.